Announcing our Guest Blogger series! Each month, “Why Quilts Matter: History, Art & Politics” will feature specially invited guest bloggers who will talk about some topics related to the series that are of interest to them. Our January guest blogger is Bill Volckening, a well-known quilt collector of both antique and contemporary quilts. Anyone who knows why quilts matter can look back at a specific point – the “eureka moment” – when they had a major epiphany about quilts. My moment was in New York City, some time around 1989. 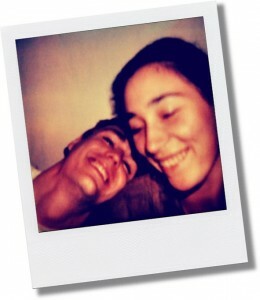 I was in grad school studying photography, and dating a young lady, Uli, from Germany. She was studying under a Fulbright Grant and her time in the U.S. was limited, so we were always on the go. We saw Cats on Broadway, Andy Warhol at the Museum of Modern Art, Siegfried and Roy at Radio City Music Hall, and everything in between. She always knew where to go and what to do. One day, Uli had a postcard for an invitation-only showing of antique quilts for sale. She had learned bits and pieces about the tradition of quiltmaking in the U.S., and she wanted nothing more than an authentic, antique American quilt to bring back to Germany. So we hopped in a taxicab and headed uptown, where a woman from Kentucky was showing quilts at a brownstone apartment. Shelly Zegart greeted us at the door. We didn’t have any idea who she was, but that changed immediately when she led us into the apartment. It was a wonderland…beautiful old quilts in all directions. I’d never seen anything like it. Shelly was clearly very passionate about the quilts, and told us everything she knew about them. Uli found an indigo and white Drunkard’s Path, and I fell hopelessly in love with one of Shelly’s very best. It was a red, white and green “New York Beauty” from Kentucky, made in the mid-19th century. Never in a million years did I think I’d become a quilt collector, but maybe I should’ve known better. I’d always had a strong curiosity for art and antique objects and collected small things from a very young age. My parents loved antiques, and we went to rummage sales, antique shops, estate sales, and even an auction or two. Digging through old things made me happy, and Mom and Dad always encouraged me to learn about the things I admired. In the back of my mind, I always thought it would be neat to own a great old quilt. It was something every person should have – something that made a house a home. When telling us about the quilts, Shelly mentioned they were superb to display on walls, as works of art. That idea, and the whole visit with Shelly, led me to realize that quilts were great works of art, among the most significant forms of American artistic expression. Quilts weren’t just bed coverings. They were remarkable cultural relics. Not only that – they were a meeting place for my love of both art and antiques. That day was when I realized why quilts mattered. It was my eureka moment. In the first episode of “Why Quilts Matter”, collector Jack Walsh talks about the importance of having a mentor. Later in the episode, Shelly says she realized there were people she wanted to buy from, and those she wanted to learn from. That segment struck a chord with me. I’ve met many people, but only a select few strongly influenced my formative years as a collector. Some, like Shelly, are people I still look to for advice today. I’ve collected a lot of quilts since 1989, over 200 of them, and it hasn’t gotten old. In fact, it’s something new every day. My interest in collecting has led to involvement with the quilt community through lectures, publications and exhibits. All of these activities are as much vehicles for learning as they are for sharing. As quilts continue to gain recognition as America’s most important and popular works of art – transcendent objects that have leapt from the beds to the walls of art museums – I think back to my eureka moment with Shelly Zegart in New York. In a lot of ways, life had prepared me to comprehend the greatness of quilts. All I needed was a spark. What I got was much better than that, and I couldn’t be more grateful. Bill Volckening is a collector who describes himself as a quilt magnet. His collection includes many fine examples made between 1800 and 2011. More information about Bill can be found on his web site: www.billvolckening.com. The December, 2011 Quilt of the Month is the first quilt I ever bought. 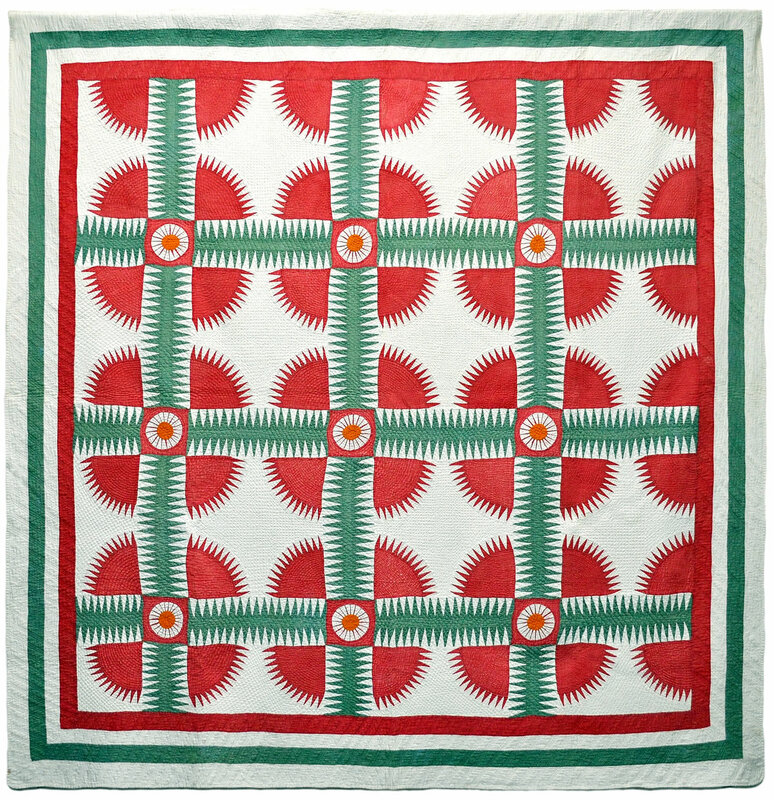 Purchased in 1989 by renowned quilt connoisseur Shelly Zegart of Louisville, Kentucky, this quilt is a masterpiece example of an early New York Beauty quilt, made in Kentucky. In 1850, around the time the quilt was made, most self-respecting Southerners wouldn’t have used a Yankee name for the quilt. Instead, these quilts had many other names, such as Rocky Mountain Road and Crown of Thorns. The name New York Beauty was first associated with the pattern in 1930, when Mountain Mist published a pattern using the name. Originally, the pattern names and motifs referred to themes such as westward migration in America and religion. In 1930, the New York Beauty name was more closely related to the American urban landscape. 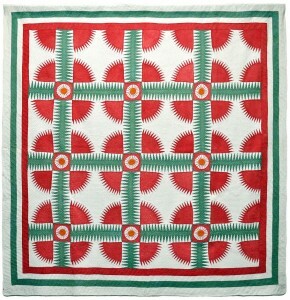 I chose this quilt for December because of the festive combination or red, white, and green – a popular combination of colors in Civil War era quilts, and annually during the Christmas holidays. Even though I knew nothing about quilts back in 1989, something told me it had to be red, white, and green to be truly old. I’ve learned a lot since then! This quilt is part of the exhibition and catalog “Beauty Secrets: 150 Years of History in One Quilt Pattern”. I,too, am a collecter of old quilts. My ancesters wer not quilters although they did make comforters, now called by some West Virginia quilts. My love of antique quilts began sometime in the early 1990’s. I go twice a year to an antique show and sale and usually come home with at least one quilt. The ones I have collected are sometimes not the best but I love them all. I’m getting older and feel I may have to stop collecting. One result of collecting is that I have become a quilter myself. It satisfies my soul. Glad you enjoyed it. I was able to find Uli’s e-mail address, and sent her a note to thank her. I’m pretty sure she doesn’t know all that’s happened since the day she took me to see the antique quilts. But she’ll know now! I’m happy to report that I heard back from Uli. She is well, has maintained an interest in American quilts, and even journeyed to the U.S. a couple years ago to buy quilts. Uli and her family are planning to come back to the U.S. next summer, and if it’s at all possible we’ll find a way to visit. Needless to say, she was very surprised and happy to hear all the news from my end. Quilts truly do bring people together! That’s great news, Bill!! Wonderful! Hi Bill… I really enjoyed this article! I’m not a quilt collector, but a quilter. I’m also a history major and I’m trying to research a paper on Civil War quilting. It has been difficult to find many academic resources and I’m wondering if you know of any you’d recommend? The American Quilt Study Group (AQSG) publishes a journal, Uncoverings, and has an annual meeting where scholarly quilt research is presented. Uncoverings publishes scholarly research on quilts and quilting, and numerous articles have been published on Civil War era quilts and quilting. An index to the contents of previoius Uncoverings articles is available online (http://www.americanquiltstudygroup.org/uncoveringsList.asp) and there is an Excel file (http://www.americanquiltstudygroup.org/publications.asp) of the articles available as well. Many university libraries have a set of the journal. AQSG is a great place to start your studies! You might also want to check out the International Quilt Study Center & Museum website (http://www.quiltstudy.org) for information and contacts. Best of luck on your paper! I hope it generates a lifelong interest in old quilts. There are many scholars and historians who would have things to say about the Civil War quilts, but Pam Weeks, who is curator of the New England Quilt Museum, recently wrote a book (with Don Beld) on the subject that is soon to be released. I’m sure you can find her through the NE Quilt Museum web site, and she’s also on Facebook. If you have trouble finding a contact, please let me know and I’ll help track her down for you.